A motorist's dashcam has captured what looks like a creepy video game or a David Lynch movie, but is in fact the hellish escape from wildfire in the northern Alberta oilsands city of Fort McMurray, Canada. 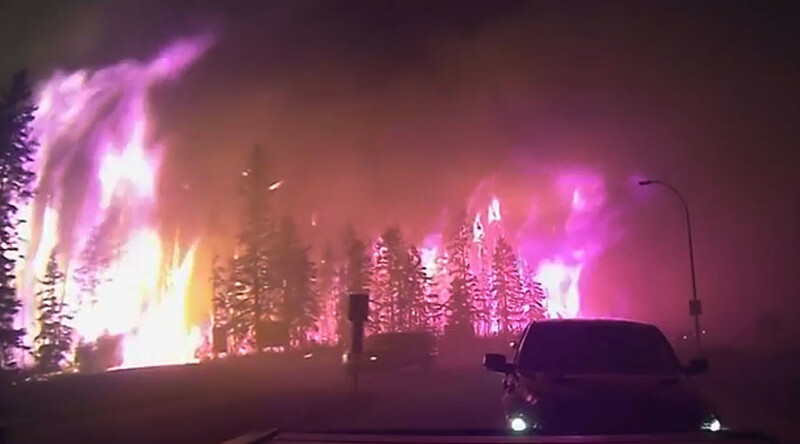 The footage captures the sinister smoke-filled sky, embers falling on crawling cars like snowflakes and deer desperately crossing the road, as a bird flies low over traffic to escape the fire. The three-and-a-half minute video keeps you on the edge of your seat. The out-of-control blaze, which forced 88,000 residents to flee, has consumed entire neighborhoods of Fort McMurray, with local authorities saying its spread threatens two oil sands sites south of the city. Over 1,600 structures, including hundreds of homes, had been destroyed by Wednesday morning, Reuters reported.